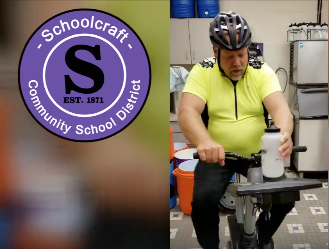 This fall Superintendent Dr. Rusty Stitt tackled walking 25 miles and biking 25 miles as a fundraiser on behalf of Schoolcraft students and the Schoolcraft Community Foundation. Over $11,600 were raised and will be given as student scholarships over the next few years. If you are still interested in supporting our students and the Schoolcraft Community Foundation please CLICK HERE to donate!